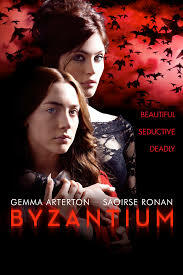 Neil Jordan’s return to Gothic horror (of sorts) has two centuries old exotic dancer Gemma Arterton and her “daughter” Saoirse Ronan ominously roaming around a run-down seaside town, taking refuge at a decrepit inn named “Byzantium”. Flashbacks reveal their earlier lives and secret vice: they feed on human blood to survive. It’s a strongly cast picture: Arterton looks spectacular and Ronan is particularly haunting, alongside worthy supporting actors like Sam Riley and Johnny Lee Miller. Jordan makes uniquely depressing use of the credibly faded British coastal backdrop, and some of the imagery is beautiful, as you would expect from the director of A COMPANY OF WOLVES and INTERVIEW WITH THE VAMPIRE – notably the waterfall of blood. Aside from a bloody decapitation at the start, it’s largely horror-lite, and settles into a low-key, ponderous story of people that just happen to display vampiric characteristics. It’s worthy, earnest, well-acted…and after a fashion, rather dull. TV clips from DRACULA PRINCE OF DARKNESS remind us of what we would rather be watching.